Fall is such a confusing time for chickens. The days are getting shorter, the temperatures are getting colder, and my older girls – Clara and Peach – are molting. Consequently, production is way down and I've had to *gasp* purchase eggs the past several weeks. The horror. The upside to buying eggs is the opportunity for a comparative analysis of the relative size of store-bought to home-grown. On our far left we have an egg laid by Eugenia or Minnie. This is their first laying season, and they are more focused on quantity than size. Then we have a store-bought Grade A Large, followed by a Grade A Jumbo. The shells are thin, the yolks are pale, and the taste is predictably ho-hum. Then we have the Mutant. Either Clara or Peach gifted me with this beauty on Tuesday. It's like whomever laid it has been working on it for a couple of days. Me: See this, Eugenia? Now this is an Egg. This is what you need to aspire to. No more of those puny things you've been spitting out. Eugenia: Let me fly up here for a closer look. Hmm...I don't know, mom. Maybe next year. It's difficult to portray just how big this mutant egg is, so work with me here. Go to your refrigerator and fetch an egg. I'll wait. Now put your egg in your hand. 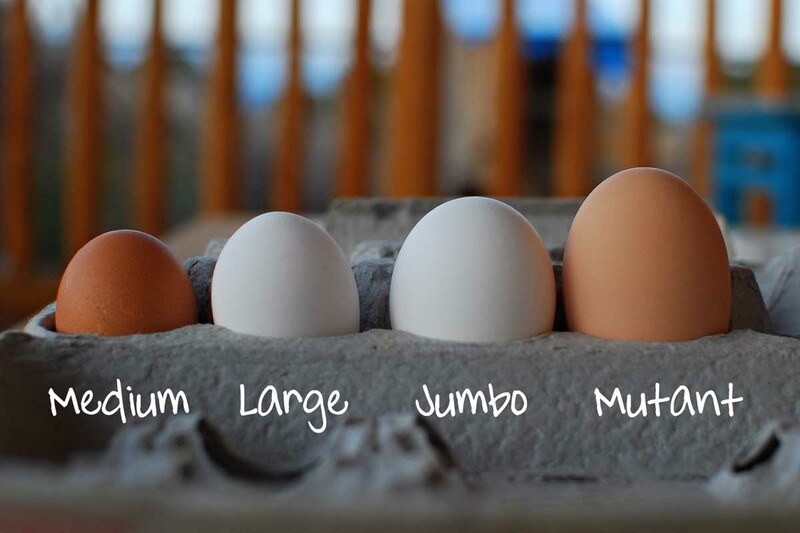 Notice how much space your egg occupies. Now look at the picture above. 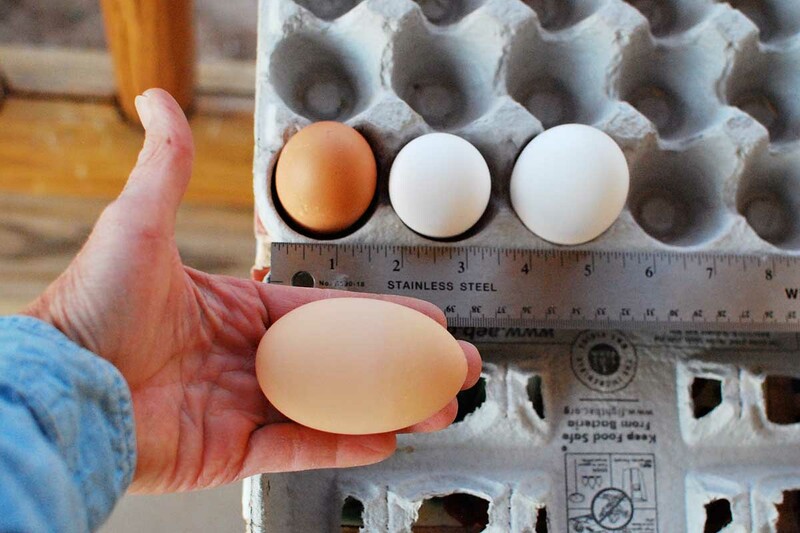 This mutant egg is so tall that the carton won't close. And the three-egg omelet I'm about to make will need only two. And every minute I spent building the chicken palace was totally worth it. It will be interesting to see if it turns out to have more than one yolk! And it'll taste like an EGG, and the yolk will sit up nice and tall...! Lucky you! Fun post! There must have been one heck of a loud squawk when that egg was laid! It had to hurt! Just like Pam, I wonder if it is a double yolker. You'll have to report! I buy fresh eggs from a 4-H teen at the barn. The taste is just fabulous! She has a variety of hens for showing, and I end up with Easter Egg colors in every carton. Seriously beautiful and a work of art! Mmm...and omelet sounds delicious this morning! Did you get a double yoke with the big one? Since we started buying local eggs at our farmers' markets, I am always shocked by the faded color of grocery-store eggs. I feel a little sad for people who think that's normal. Did you notice any hens waddling extra funny? That would be my guess for the Mutant Egg Mama. b'gAWK!! Now that is what I call a "super sized" egg! I buy my eggs from the farmers market every saturday. They are very fresh and taste WAY better than store bought!!! p.s. My co-workers and myself discuss and solve the world problems at the coffee break table, and we decided that we would buy as much product and produce at local farmers markets. 1) the produce TASTES way better. 2) it supports our local economy which are usually family operated. 3) our friends and family are gifted with some really neat and interesting crafty, useful, and fun items for Christmas,,,,and it supports the local economy. I love getting those mutant eggs. My chickens are on hiatus as well. I had to *gasp* buy eggs, as well. Boring. Only fit for baking with. I would blow out the contents of that egg to preserve it for the sake of wonder. We used to do that when we would decorate eggs for Easter. My dad would tap a hole into the ends of the egg with a small nail, and then we would blow and blow until all the contents of the egg were gone, and then we'd rinse the shell really good and let them dry. Waiting for them to dry was the hard part...because the decorating was so much fun! That is one huge egg!!! How many yolks did it have, btw? Are you sure you don't have an ostrich hiding somewhere on your land? 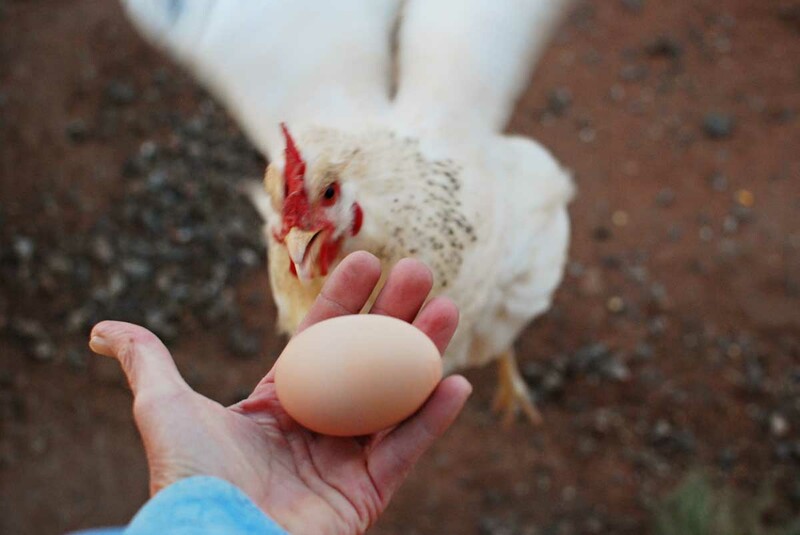 One of our chickens would surprise us every once in awhile with a huge egg like that. Hard to believe something that large can come from a chicken. I bet it will taste yummy and hopefully be a double yoker! Oh my!!!! That is awesome. 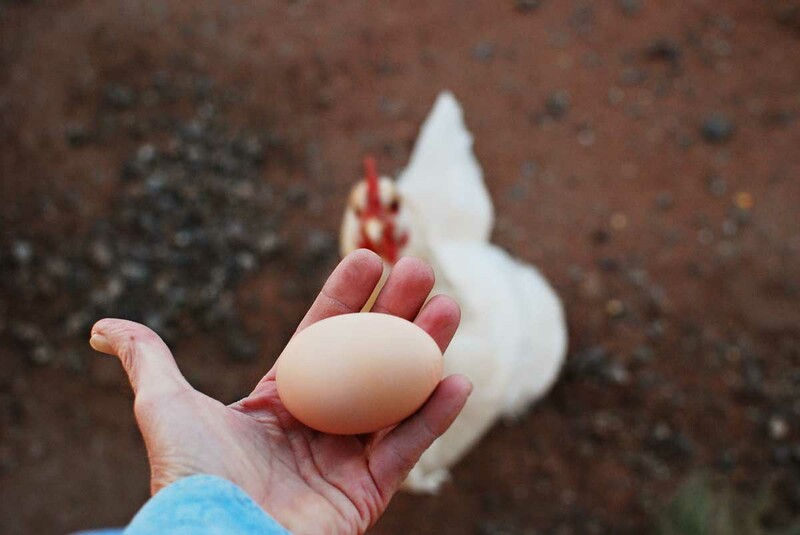 That is one super-sized egg! Lucky you! I would take any one of their eggs...small, medium or large...over a store-bought egg. Now, that's an egg! One of our girls is molting, so no eggs from her lately. Today, it is snowing and the girls are hunkered down in their coop. I'd like to think they'd spend the day in their warm coop producing some eggs, but I am not holding my breath. We are down to four eggs in the fridge and I refuse to buy commercial eggs! Do you know what I'm going to ask? Yup. How much does that mutant-baby *weigh*?! I'm dying to know. In my 3 1/2 years of chicken-keeping, I've had a number of eggs that challenged my ability to close the carton lid, but I don't think I've yet to get one that truly prevented me from closing the carton. Amazing!!! Funny story...I had a college educated dietitian stop getting eggs from me because "the yolks were to yellow"! She felt more comfortable with store bought eggs! Crazy?? To me store bought eggs are horrible to the 10th power. My girls lay all winter because they have a light in their house. But on the bright side buying store bought eggs you get clean/new cartons for "free"! You could make a quiche with that egg. I'm impressed. 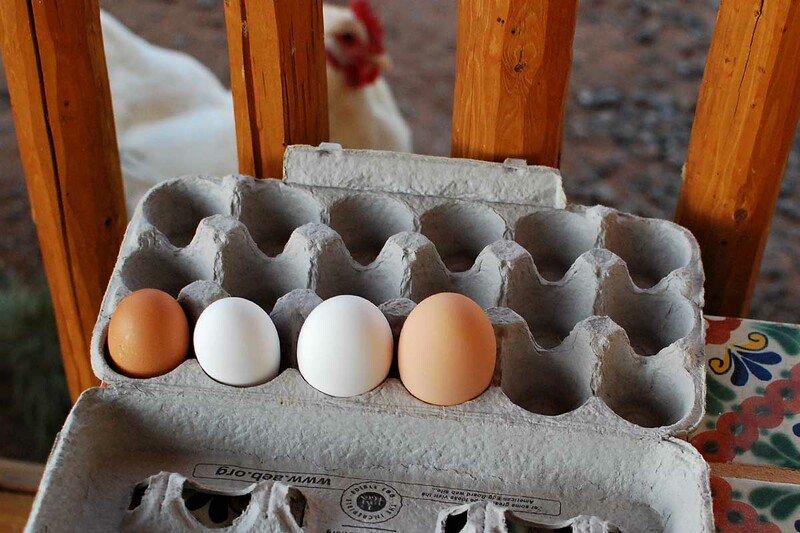 Love farm fresh eggs. The best part is you know what the chickens are eating. To theresa EH, a big "thank you" for your decision to buy local. I live in a small farming community where we all participate in producing veggies that are sold at a local stand, directly to the public. 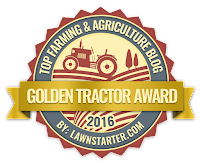 It's not just a good thing for farmers and buyers, it's a benefit for the whole community. It gives kids jobs and preserves farm land. To anyone who is considering backyard hens, I'd like to recommend Anconas. Fifty years ago they were a popular egg breed, replaced by white Leghorns. 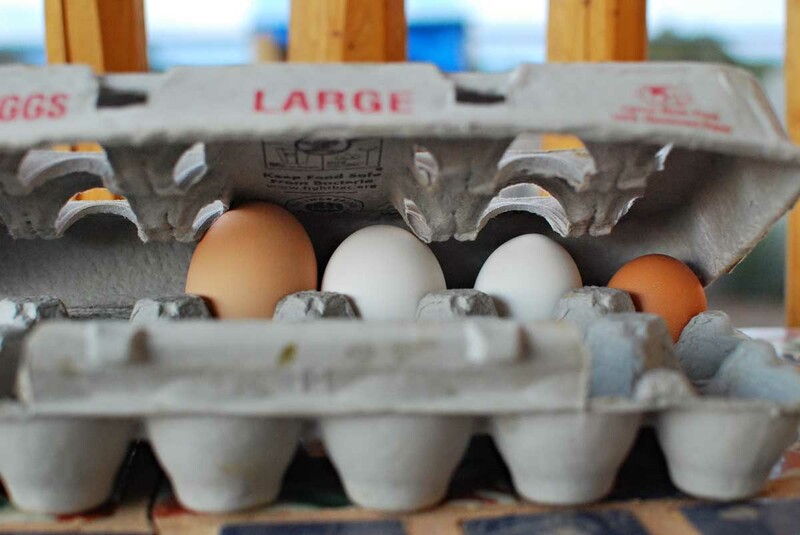 They're very hardy and self-sufficient and lay an abundance of huge white eggs. My son won best eggs at the California state fair with their eggs 3 years in a row. You can order them from Murray McMurray, and when you raise them you're helping preserve an heirloom breed. OMGoodness!! I absolutely LOVE farm fresh eggs....If I could keep one or two hens for the purpose of eggs I would, but where we are moving to won't allow it. However, there is a lady who lives just down the road and I can get "farm fresh" anytime. I will only use farm raised eggs for baking, eating etc. The yolks are fabulous and so tasty. I also get my eggs from Farmer's Markets and friends who raise chickens. They have better prices and you know they aren't pale in color. I get the occasional mutant egg, too. It always makes me feel bad for the chicken who had to lay it! BAWK!!! !